Can you imagine a Glee without Chris Colfer? We all know the story. When Chris Colfer auditioned for Glee, the role of Kurt didn’t exist. In fact, in the original script, there is a character called “Rajeesh” who has largely the same lines in the pilot as Kurt. So they swapped one character for another. Of course, we know nothing about Rajeesh, because his character never made it as far as the Pilot. But then Chris Colfer happened, which I’m pretty sure will become some kind of pop culture catch phrase soon. Because when he auditioned, the writers/creators/powersthatbe were so impressed with him that they wrote a new character, called Kurt. Now, just for one moment, imagine Glee without Kurt. It’s impossible to guess, really, what way the show would have gone. Could it have been an entire season of Finn/Rachel and Puck/Quinn baby drama? And what of season 2? Will and Holly? Sue divorcing herself? Kill me now. As it is, Glee is known widely as the gayest show on television. Not only do the characters sing and dance a lot, but the entire first two seasons have been at least somewhat focused on powerful gay storylines. In season one, Kurt struggles with coming out to his friends and his father. In season 2, there’s a bullying arc that engulfs much of the first half of the season and we get some squee-worthy gay romance towards the end of the season (not to mention Santana, Brittany and Karofsky giving plenty of burgeoning queer stories for season 3 fodder). Oh, and Rachel has gay dads. It’s all so gay. For me, the most difficult episode I’ve had to do is the “Prom Queen” episode, when Kurt was crowned prom queen. Just picture me in my bed at home, reading the script, not expecting Kurt to be crowned prom queen, and I read that he’s in a kilt and tiara, dancing to “Dancing Queen.” I was like, “No, this cannot happen.” I was so concerned they were just pushing it way too much, because Kurt has been so helpful and progressive for some people, and I was afraid this would damage that—it was just too, too much. But they assured me it would be done in a great way. Originally it was written that Kurt was persuaded by his boyfriend to go back in and accept the crown. But I asked them, “Please let Kurt do that for himself and not be persuaded by a second party.” And they changed it for me, and it did turn out to be a beautiful episode. I was so wrong. One of the least irritating things about “Prom Queen” (an episode I was quite conflicted about) was the massive character and relationship development that happened in the darkened hallways of McKinley High during prom. Kurt decided he would be true to himself and stand up to show the bullies that there was no way to keep him down. And his boyfriend sat, and listened, gave him options and supported him. It was good, in character, inspiring and of course it wasn’t in the original script. Whatever about not having Kurt in the show. 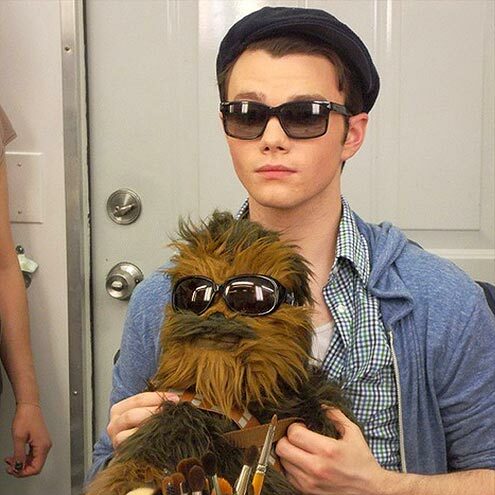 Glee is better for having Chris Colfer hanging around, for whatever reason. I would not have watched past “Preggers” if not for Kurt/CC. Period. And as much as I think it is a dangerous situation to have a single actor within an ensemble wield the kind of power over storyline and culture (and script) that CC has, I, too, am grateful for his precociousness and nearly unbearable charisma. Feel like I have more to say on this, but will stop at that for now. I’m not certain that asking to have a character moment changed indicates that Colfer has enormous power over storyline and script. The bullying storyline focusing on Kurt came from the fact that the media was finally focusing attention on the suicides of gay teens (with a focus on peer bullying), and seems to have been largely Ryan Murphy’s idea. It’s not really uncommon for writers to ask or listen to characters re: what that character would do or say in a certain situation. Oh, I’m not really thinking he has any huge power over the storyline and script — not directly anyway. And not like in that particular instance, but more that his character and what his character gains from CC’s ability and who he is in general, has changed things a lot. And I could be totally wrong, which is always a possibility. Ah, but influence is a totally different thing than power, which is the word you used in your original comment. Yes, Colfer has had some influence on storylines, but no more so than some of the other actors, I think–Darren Criss has mentioned that performing “Animal” was his idea, for example, and some of the other actors have mentioned that the writers have pulled inspiration from their real lives the same way they did with the “Defying Gravity” incident. It seems like the Glee writers use their actors as inspiration or sounding boards fairly often–I think you’re seeing it as Colfer going up to the writers and suggesting changes, as he did in the example above, but in the case of at least Defying Gravity, all he did was relate a story from his life, and the writers used it as fodder for their story. Television writing is actually a pretty inherently collaborative medium in general–think about all the people a script has to be sent through to get to air, and the fact that it staying on the air at all comes down to corporate sponsership– and actors always have a certain amount of influence over what they will or will not say and do–after all, tv isn’t a novel. Actual people have to say and do the things that are written for them, so it’s not just the writers who are affected by what’s written. Kate, I expect you know more about the industry than I would care to (I like to keep the magic behind the curtain as much as possible). And if I say “power” it probably has a different and stronger connotation to those who think in a post-graduate way about such issues, whereas I’m approaching these topics on a gut level, as that’s the way I feel comfortable. I can also overstate my case for effect on occasion, which is no doubt irritating to those who are thinking critically; I’ll try to be less lyrical and more analytical in the future. What I do know is that Colfer has stated in interviews that he “lobbies” for certain storylines. Perhaps all actors do. My hope is that Chris’ status as beloved savant (and I’m 100% on that ticket, I’m not attempting to bash him in any way, I assure you.) does not seduce the writers into an even more unbalanced Season 3, at the detriment to the show as a whole. If there was no Chris Colfer, then they would have imported the gay kid in Season 2. and it would have been played by Chord Overstreet and his character will end up having a romance with Karofsky while still being on the football team.